When you've seen one pine tree, you've seen them all. 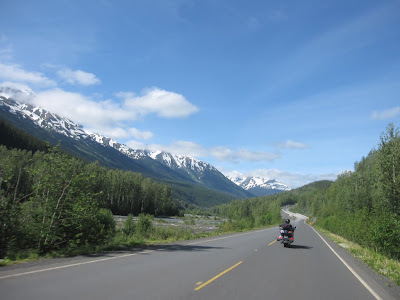 That was my take of the much celebrated Stewart-Cassiar Highway (Hwy 37) in British Columbia. That was largely what we did today, ride that highway. It's a very picturesque highway, there's a couple of places with some beautiful stretch of scenery, highlighted by tall snow-capped mountain peaks, with pristine lakes, and carpets of pine trees. But once we lost sight of the mountains and lakes, all we had was millions of pine trees to look at. And it's not like the Stewart-Cassiar Highway offers lots of twisties. It's a lot of straight road, and some very wide sweeping turns. But for the most part, it seems the road is overrated. For one, there's lots of potholes. British Columbia doesn't seem to fill them up with asphalt, but rather, sand. As a result, you run into patches of loose sand on the road. And some of these potholes are large. There's a section south of the Dease River Bridge that's all gravel, and at the time we rode it today, construction crews were working on it. They had it watered down, slick and muddy. Somehow I managed to keep the Honda ST upright, though still experiencing some sliding from its sport-touring tires. The Batwing: If Batman rode a Goldwing, would it look like this? And the road itself is long, it's like travelling from Los Angeles to Salt Lake City, but on a two-lane road with potholes, and very few places to stop along the way. And if you dare to stop, the gnats and mosquitoes are all over you. It's like they watch for travelers and hope that they stop. And when they stop, the swarm in on you. I had to stop because it was still rather cold in the morning and I needed to put on my Gerbings. Those bastards were all over me. I had to put my full face helmet back on just to keep them off my face. But we did get to see wildlife on this road. I spotted a few black bears, a moose, and some rock sheep. 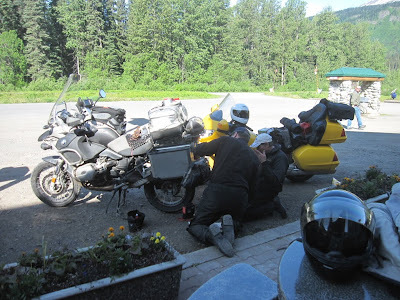 How many riders does it take to fix a punctured tire on a BMW GS? We stopped at a resort town called "Bell 2". It's really nice looking resort, the kind of place you'd want to spend with your wife on an anniversary. We met a couple of other riders from New Jersey there. They had just come down from Deadhorse, having ridden the Dalton Highway. Both of them had snobby, "holier than thou" attitudes. 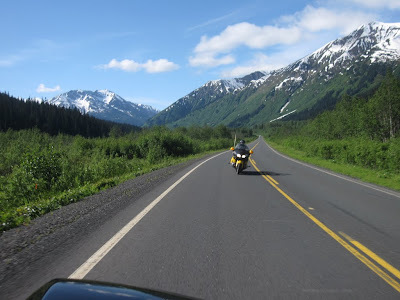 One guy had a Goldwing and seemingly chastised Mike and Paul for having put car tires on their Goldwings, and then went on to point out that he completed the Dalton Highway with a regular motorcycle tire. His buddy was even more pissy having to nurse a punctured tire on his BMW GS. 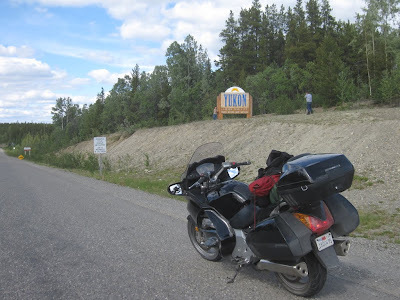 We also stopped at Dease Lake, a resort community located about half-way up the highway. I had lunch at Mama Z's Restaurant. The food there is not that good; it seems the decoration is far better than the food quality. And Mama Z herself kept apologizing to us for the poor serving, explaining that she has to do several jobs. I knew I should have went to the local pub instead. We finally made it into Yukon Territory. I've never been here before, but so far it's looking a lot like British Columbia. 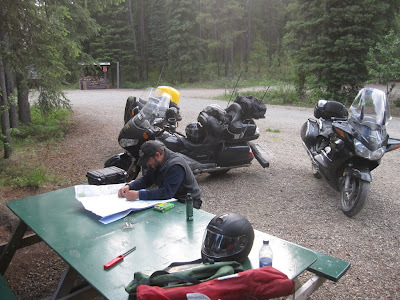 We managed to set up camp along the Alaska Highway at a public campground called "Big Creek". We met a couple of riders from Connecticut also camping there. They were headed up to Dawson City for the Dual Sport Rally Get-Together (they told me we're not supposed to use the "R" word, but that wearing leather is still ok). The Yukon government does a great job of offering a network of public campgrounds. They're only $12.00 a tent, and you pay on the honor system. They provide tons of free firewood, extra large picnic tables, lots of restrooms, and bear-proof food containers. We also met another camper there from Fairbanks. He brought his dog with him, and stopped at our camp to introduce himself. The mosquitoes were all over him, and he explained that when you live in Alaska you get used to them. He was wearing shorts, and I couldn't help notice the 20 or 30 mosquitoes on his legs. His legs were also bleeding from scratching the mosquito bites, and then his dog was licking the blood off of his legs. It's like 9:30pm right now, and full daylight. By the way, I have no Internet access here nor phone coverage. I'm just typing this out into a text editor, and waiting for some other place where I can get online. Tomorrow, our goal is Tok, Alaska. Again, great local color in your writing. Rough road conditions there - and I thought my state, Rhode Island, had bad roads. Maybe R.I. will resort to patching potholes with sand, since the state is broke. Oh and that dude's dog licking his bloody mosquito-bite scabs is not a pretty visual, but as I said, your post sure is colorful ... and that's a good thing, man! Keep the shiny side up and the rubber side down.